iris is an expert in automated people counting. 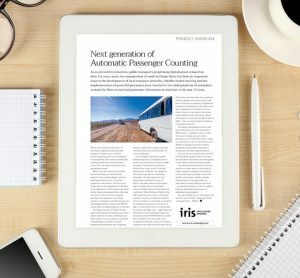 The Berlin-based company iris-GmbH has been supplying the global market with reliable technologies for automatic passenger counting for more than 25 years. The US market has been served by the subsidiary iris Inc. in Atlanta since 2016. IRMA, the main product, is a passenger counting system. IRMA was developed for use in urban public transport and it is used in many cities throughout the world. Our portfolio of sensor technologies for automatic passenger counting comprises a wide range of performance classes. The data gained by IRMA is used for the business optimisation, capacity adjustment and revenue sharing in Public Transport associations. The sensors are mounted above the vehicle doors and transmit the quantity of boarding and deboarding persons. IRMA counting sensors work with 3D image streaming. The basis is the distance measurement according to the time-of-flight principle (TOF). This ensures reliable detection under all environmental conditions and reliable counting even in crowded situations. Modern interfaces to the on-board computer enable simple integration. iris-GmbH is one of the leading manufacturers of passenger counting systems for public transport and develops both hardware and software components for the sensors in its own research departments. The company cooperates with research institutions in Germany and abroad to design technology-based solutions for the growing world market. As in all modern industries, the progressing digitisation in public transport is based on data. For many years now, the management of small and large fleets has been an important issue in the development of local transport networks. Satellite-based tracking and the implementation of powerful processors have resulted in the widespread use of telematics systems for fleet control and passenger information in real time in the past 15 years. We are now seeing a further boost in innovation, triggered by powerful and globally accessible server networks (cloud computing) and the mass adoption of smart phones. New system architectures including mobile devices and datasets in the cloud are under discussion or are undergoing practice tests. Linking data in cities and regions is known by the term of smart city or smart region. IRMA 6, the new sensor by iris-GmbH, is an offer benefiting the fast evolving digital structure in public transport. These sensors are an excellent source of the data required for the new services. The focus is no longer only on the management of the fleet or the deployment of the vehicles, but rather on the control of passenger flows. The more accurate the data, the more accurately can the passengers plan their trip – inclusive and individualised public transport – and the IRMA 6 sensor offers crucial prerequisites to this idea.